Planet Earth II: How a lion chases a Giraffe in Namibia's heat? Los angeles : Planet Earth series is really intriguing to watch and the new episode which features a lion catching up with a Giraffe win all brownie points. The Sunday's episode of Planet Earth II shows Sir David Attenborough's epic natural view on how animals in deserts have developed ingenious ways of dealing with the hostile conditions. 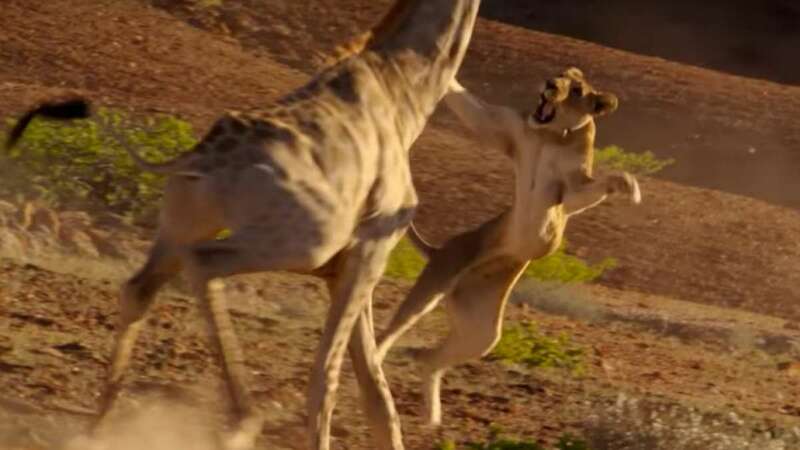 As seen in the video, desperate measures can lead to really conflicting tensions with surviving heat that can go up to 120 degrees C.
In such heat, creatures resort to desperate measures to survive and therefore desert lions who are so hungry can even risk hunting a giraffe several times their size. The stunning sequence glimpsed at the end of last week's episode shows how Namibia’s arid gravel plains, which are incredibly hot, can become the area of a wild hunt. Ed Charles, producer of the episode says, "We’ve got a fantastic lion sequence shot by two very talented people." "They managed to get access to this pride in Namibia, true desert lions who live right in the sand dunes. The sequence they shot shows the lions trying to take down a giraffe, which was epic." Watch the video to witness the real hunt! To watch the complete episode stay tuned with Discovery on Sunday night.